Mariana Jacoby in her National Costume designed by Neftalí Espinoza. 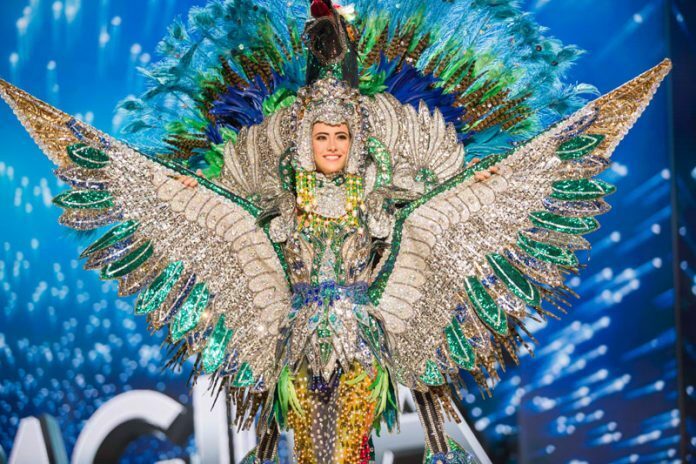 The costume pays homage to Turquoise-browed Motmot, locally called as Guardabarranco, which is the national bird of Nicaragua. Marina Jacoby rose from her relative obscurity to become a front-runner at Miss Universe 2016 was assuaged when she topped the Missosology’s 5th Hot Picks. 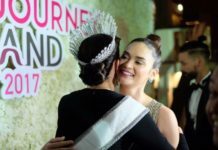 The in-house beauty experts tagged her as strong contender and her dull campaign for the crown was given a much needed jolt. It also helped that the press in her native Nicaragua also took interest! Beauty experts took a second look at Marina Jacoby not because of some preliminary performance or a dramatic twist of some sorts. It was largely a way to quench their thirst for a surprise winner. By the standards of Miss Universe set a decade ago, Marina Jacoby did fit perfectly into the description of an underdog that can take it all in the finale. Many pageant experts were impressed when they saw Marina in person. It explains why she was largely unnoticed in the earlier editions of the Hot Picks. You have to see her face to face to be impressed by her beauty. Sash weight, poor prelim performance, weak personality…all the usual reasons why a candidate missed the final berth do not apply to Marina Jacoby. Many countries with weak sash weight made it to semis. Marina’s prelim performance was excellent with her mile-long legs as her biggest asset. Her personality is bubbly and very engaging. It is simply difficult to pin-point on where did Marina fail! Marina Jacoby used a red gown during the prelims designed by Peruvian designer Eduardo de las Casas. She has a much more spectacular gown specially reserved for the finals night. But here’s one small thing: those standards of Miss Universe that most of the experts became familiar with no longer applies in the current edition of the pageant. Needless to say, the pageant will become more difficult to predict in the future. There is now a need for future contestants to recalibrate their strategies. Miss Universe is no longer about being fierce or being a showstopper. A Miss Universe now must be a woman with a substance. It’s no longer about just looks. She also must be intelligent, strong and independent. Of course, this doesn’t mean that Marina Jacoby lacks substance. On why the judges felt she is not good enough at the Top 12 while beauty experts think otherwise is something that can be revealed based on what happened closed doors. Key to this is what really transpired during the one-on-one interviews. Still, it is improbable that Marina, a Latin American contestant who speaks perfect English, will not ace her interview. Strange as it may seem, the failure of Marina to land in the semis runs in parallel with some of the out-of-the-box choices of Miss Universe in its roster of semifinalists. The taste of Miss Universe is changing and for analysts and experts who are tracking the trends of the pageant, it’s back to square one. The inexplicable exclusion of Marina Jacoby from the Miss Universe 2016 semifinals heralds the fact that within the pageant, change has truly come.